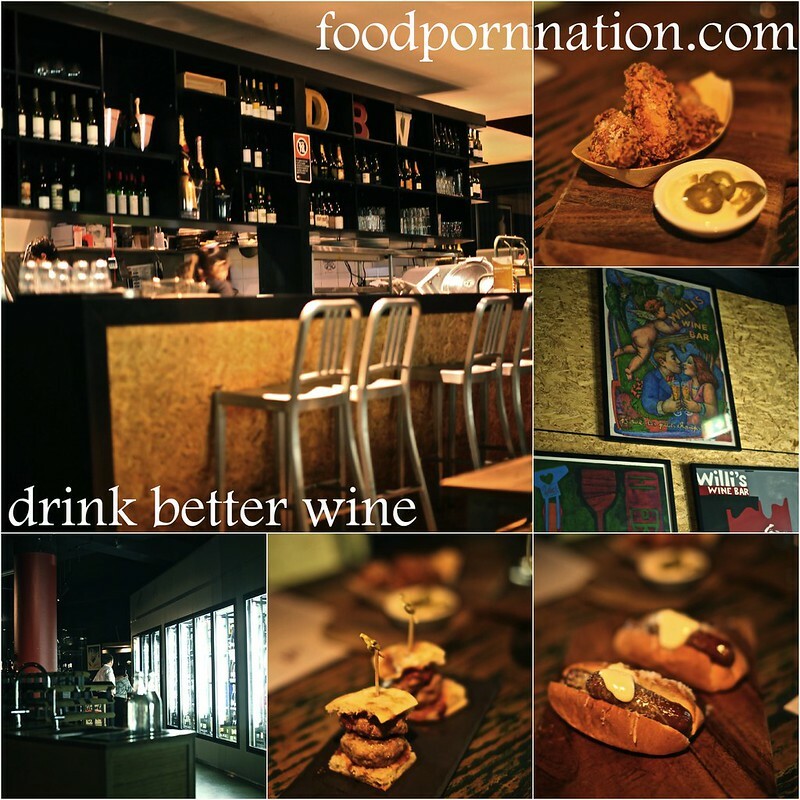 Drink Better Wine was conceived so that a bottle shop could operate in the same space as a restaurant. Customers could eat their way through the menu, walk the aisles of the cellar, pick their wine and drink straight from the bottle without paying any corkage. Since their conception, they have changed their pricing structure to match their online wine prices which is at a significantly reduced cost. To make up for the difference, they now charge a $10 corkage per bottle. I am told that even with the corkage the price still works out to be cheaper. Even so, the sound of not paying corkage versus paying corkage, will always have a better ring to it. Even if this means passing on the savings to the end consumer. I’m not terribly phased though, good food and good wine awaits me and it will be cheaper too! Relatively new to lower north shore area, this has fast become one of my personal favourites and probably one of the area’s best kept secrets. 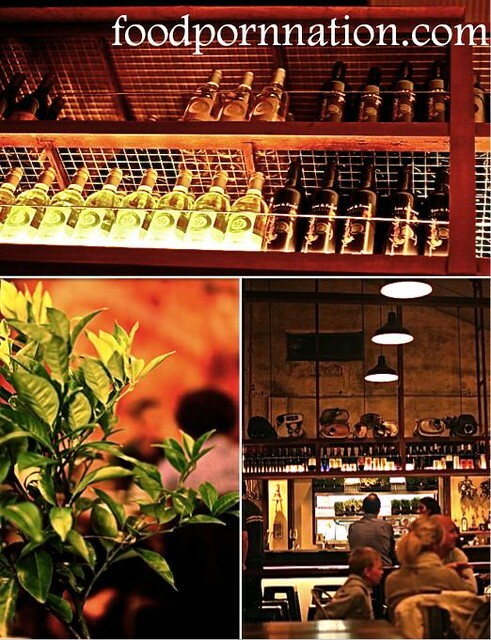 It houses a hot pot of all your asian favourites… but served tapas. I’m talking Jap, Malay, Filo and Chinese food all served in the one convenient location. SpaAsian tapas? How glorious! 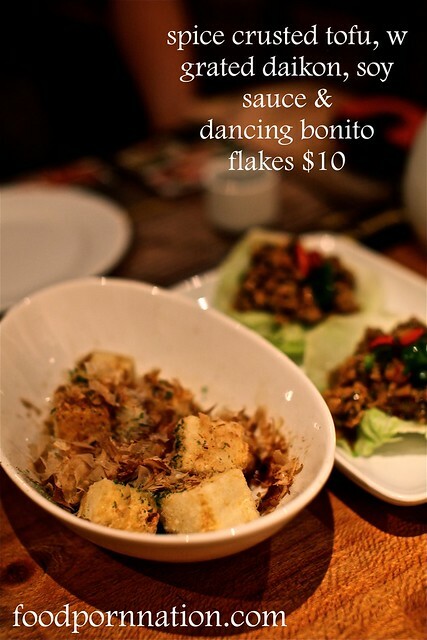 And if you come between Mon-Wed, you can even get their $10 tapas. Sounds too good to be true but the owner (Alan) has made great strides to maintain the integrity of the combination of all these flavours. Housing a Filipino chef, a Malaysian chef, Alan has personally taken care of the rest by recreating Chinese home made favourites and studying Japanese cookery. We begin with the spice crusted tofu and it is a wonderful play on your humble agedashi tofu. In fact, I think it is much better. The tofu is squared off into bite sized pieces providing more surface area for a nice and crisp exterior. The edges of the tofu are super crusty and equally find themselves with a healthy dosage of soy. Sprinkled on the top are the bonito flakes which to my surprise, are literally dancing along my tofu in beautiful symmetry. 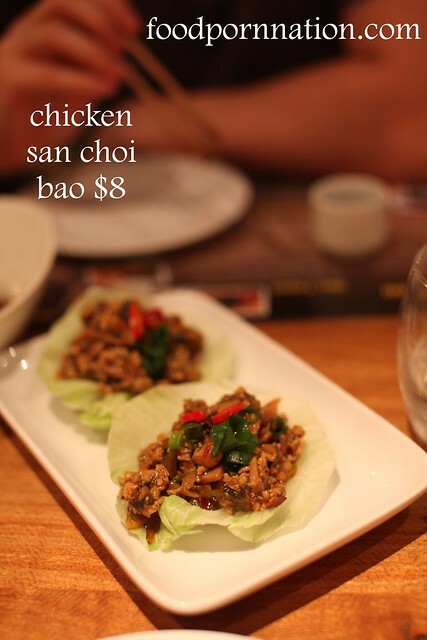 The san choi bao is pretty mind blowing. Delivering generously on flavour and texture. It rightfully upholds all the flavours and is quite incredible. 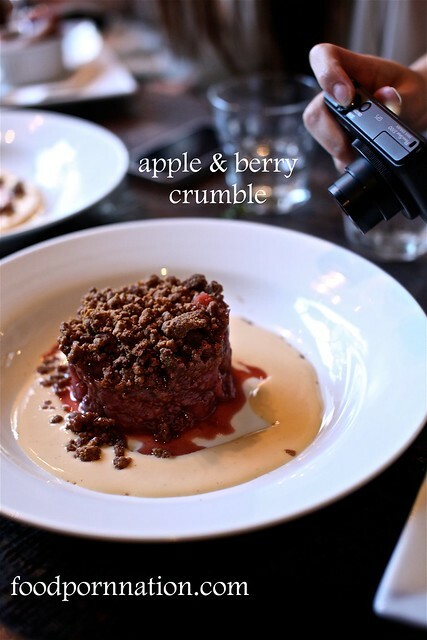 This is one dish that should not to be missed. 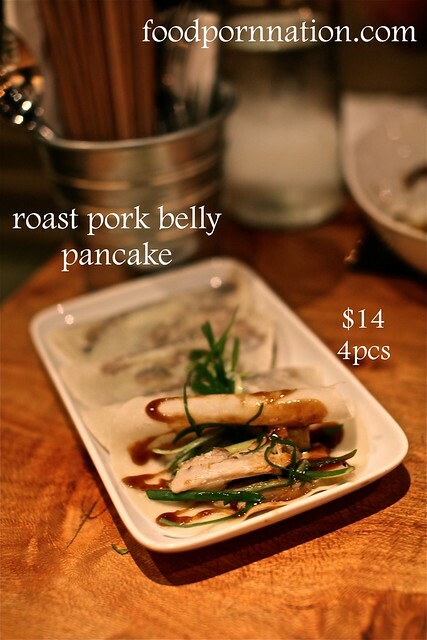 The roast pork belly pancake plays on a Chinese favourite. Instead of peking duck, here we have roast pork belly, all pre-prepared with all the trimmings and it is absolutely incredible. The pork is slippery, silky and packed full of flavour. It doesn’t have the crunch factor of the skin but the flavour wholeheartedly offsets the need for texture. But then again, crackling is not something I would ever say no to! 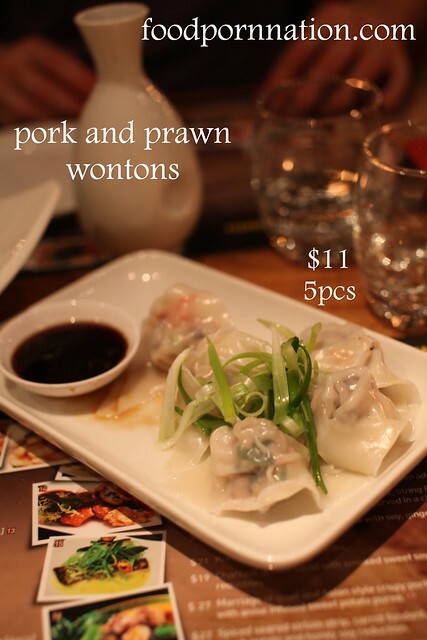 I am told by the owner that the pork and prawn wontons were just hand made and they usually are. Alan, grew up with his grandma making these family favourite for him as a child and lucky for us, he too has decided to pass on this family gem. The translucent skin is neatly tucked around to expose the fleshy prawns and meaty pork filling. 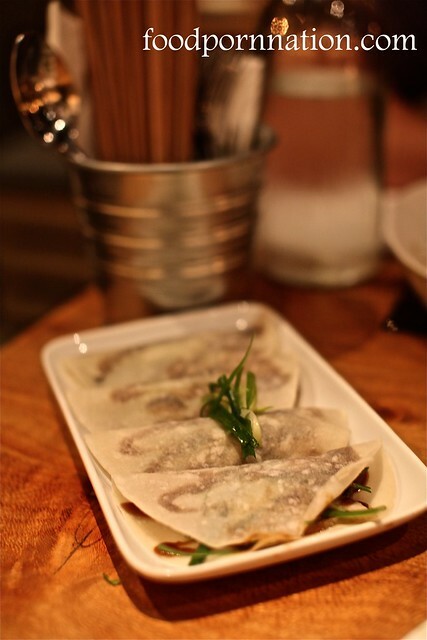 These dumplings are really quite remarkable that there really are no words. 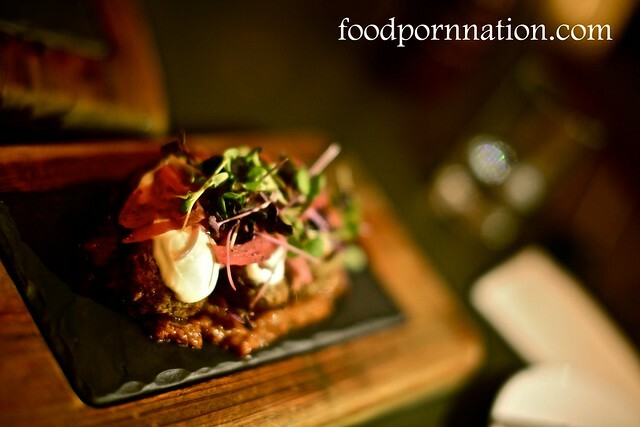 Porteno is 2 years in the running and already it has risen to the stars. Having recently been crowned at the Good Food Guide awards with the best chefs of the year (Ben Milgate and Elvis Abrahanowicz), Porteno is also brimming with a 2 hat rating to boot. Ideal for meat lovers and big groups. It’s Argentinian fare, brought to you by a traditional Parilla (barbecue) and Asado (pit of fire) with carcasses splayed and spinning for your viewing pleasure. This is expertly tended to by Elvis’ dad (Adan Abrahanowicz) and served to you by hot to trot 50’s pin up waitresses. First up, Ensalada Palermo Viejo. Kind of like your pizza look-a-like and is covered in a tahini base with all the roasted trimmings nestled on top it with a gooey quail egg added for good measure. Emma G ceremoniously did the honours of slicing and dicing (cos she always does this so immaculately) to reveal a delicious resounding crunch of the hard base and it only seemed fitting as she was London bound for an indefinite length of time. Naturally we had to make her pay for it and dish up everything in sight! 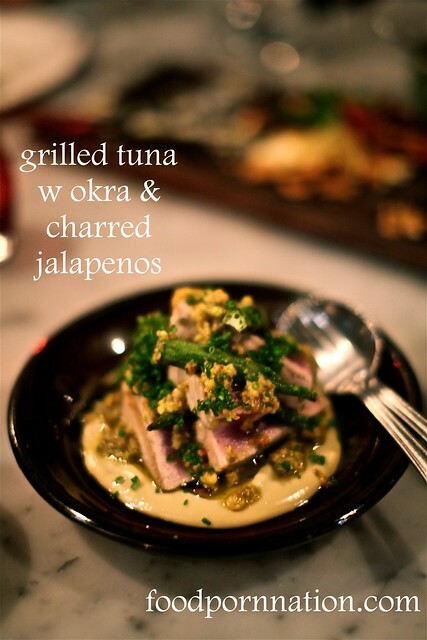 The tuna is cooked to expose a luscious pink in the middle centre and is rested upon this glorious garlic sauce. It is so tasty you could lick the plate and even your mum couldn’t hate you for it. And it all comes covered with asparagus, capers and jalapenos all smokey and charred to give it that added flavour and crunch. I was pretty impressed with my food eating crew. We all leaped at the opportunity to hack into the blood sausage. Most people get put off by the thought of it. Not us… we practically hoovered it down, not even with the slightest hesitation or an afterthought. It was meaty, smokey and incredibly juicy on the inside. 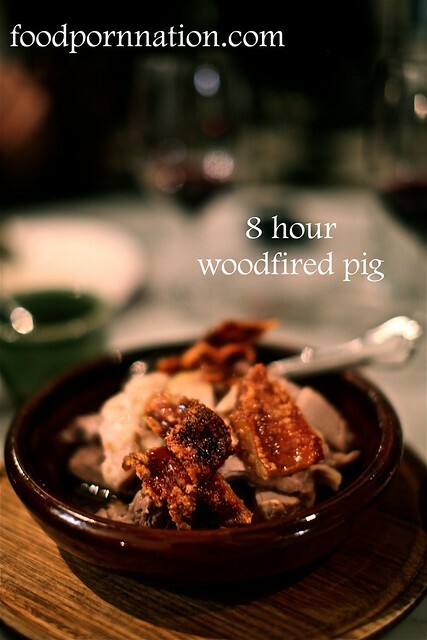 The 8 hour woodfired pig is justifiably famous and rightfully so. Its moist centre glistens with its own juices and with the fat shining just as bright. It tastes just as sweet. And of course, you can only judge a pig by it’s crackling. With a rock hard blistering exterior and indisputably emphatic crack against your jaw line, there is no arguing that this is the perfect pig. 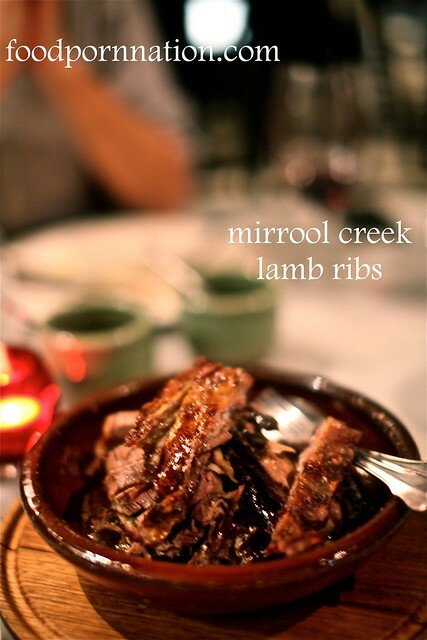 While tasty, the 8 hour woodfired lamb but didn’t quite hit the same note as the woodfired pig. I guess I’m just a die hard pink in the middle or (red raw if you will) kind of girl when it comes to my lamb. This is so… good, that it has to be bad! The polenta comes out luxuriantly silky and rich that a couple of heaped spoonfuls is just right. 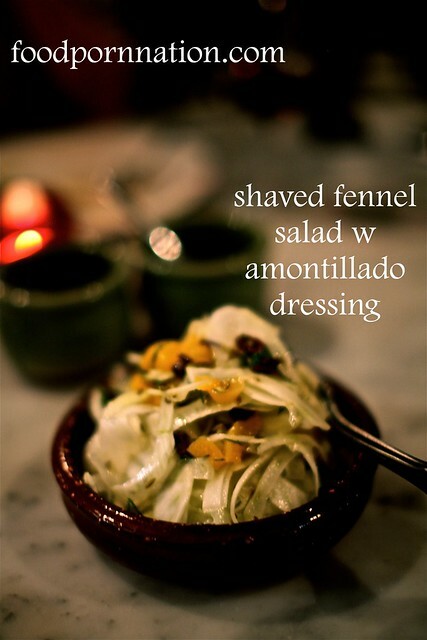 The fennel salad is tasty, textured and wonderfully fragrant. Considered another non-negotiable must have item among Porteno fans. 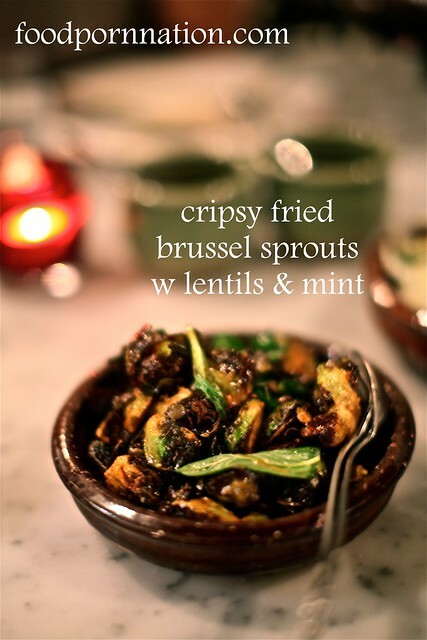 If you’re not a fan of brussel sprouts, try their fried up and nutty version and it is likely to change your tune. It still has that distinct bitter brussel-ness to it but I can assure you most of the aftertaste subsides. 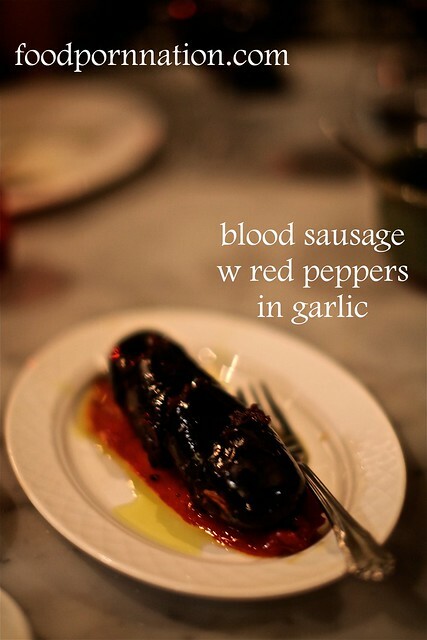 This is not for the faint hearted, it boasts rich and powerful flavours. The quince sits within the gorgeous crumbly base while the gorgonzola cheese is whipped through the muscat ice cream. This is then piped on the tart’s surface. I personally loved the cross between sweet and savoury and find that all the flavours are a perfect accompaniment to one another. But this definitely had a lot of love-hate chit chatter going on at our table. 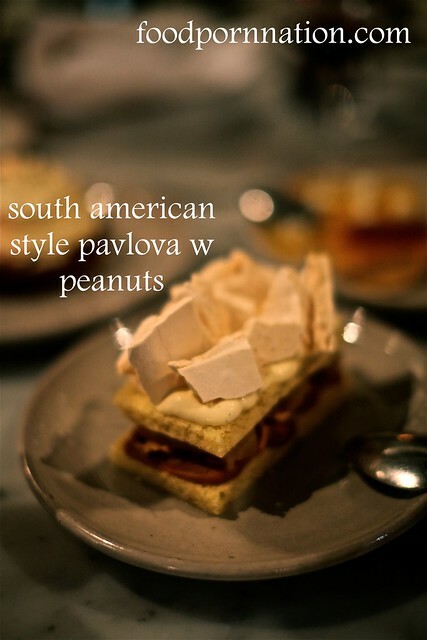 Probably the best pavlova I’ve ever had and was an easy crowd pleaser among the group. 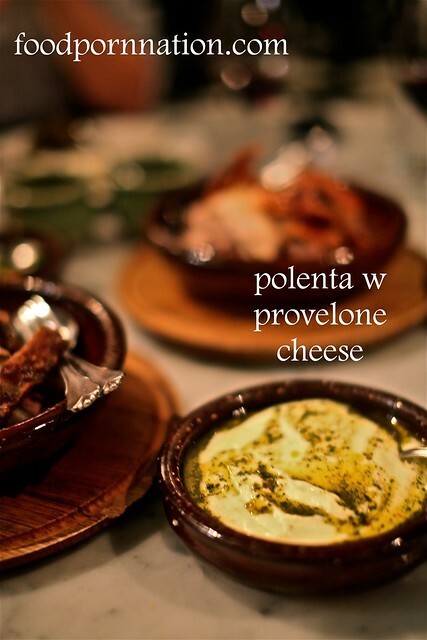 And again, its considered a favourite of Porteno fans. 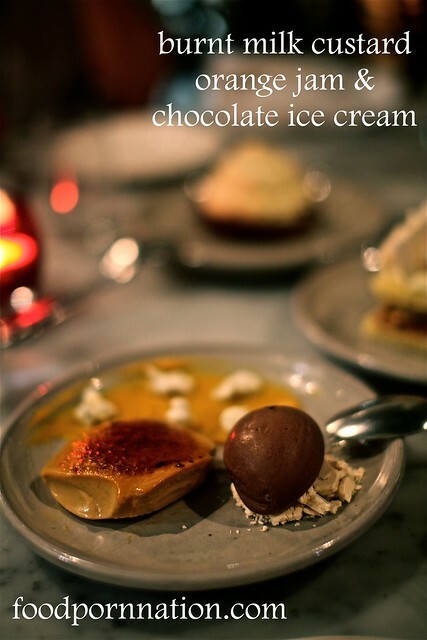 Unfortunately, the burnt milk custard, orange jam & chocolate ice cream didn’t quite do it for me. I’m not a fan of chocolate orange, so the battle was already lost before it had even begun. And the chocolate was just too rich for me. So really, I’m not really in a position to comment. 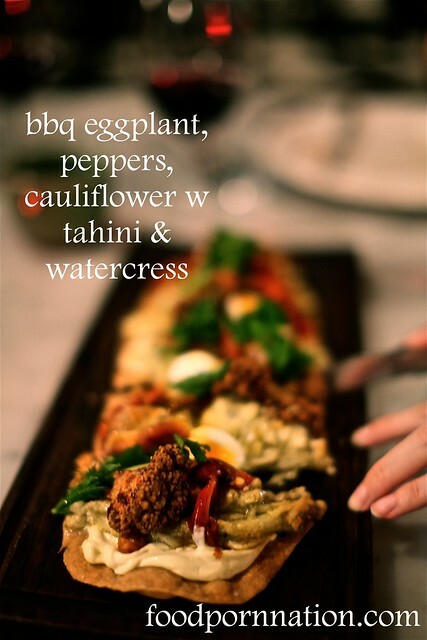 Welcome to Porteno, for Argentinian fare served with Argentinian flare. As Excuse Me Waiter‘s plus 1, I attended the Ladies Lunch Blogger Event at The Village, for a very sizeable set menu and cocktails jugs to boot. And for anyone who knows me best, surely knows that I couldn’t even stand a chance of saying no to that. For just $39 per person on Saturdays and Sundays, you can round up the girls for wine/cocktails and a very sizeable set menu all dished up in a very stylish, sheik and modern setting. Antipasto Plate – cured meats, artichokes, chargrilled red peppers, semi-dried tomatoes, marinated olives, hummus, beetroot dip & toasted sourdough. 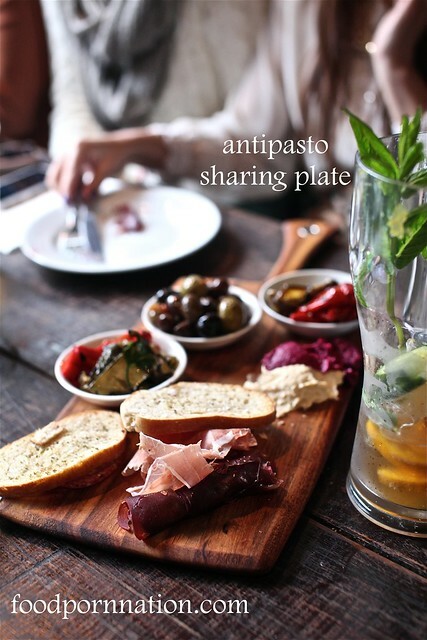 The Antipasto Plate was a great way to kick things off and share between perfect strangers. 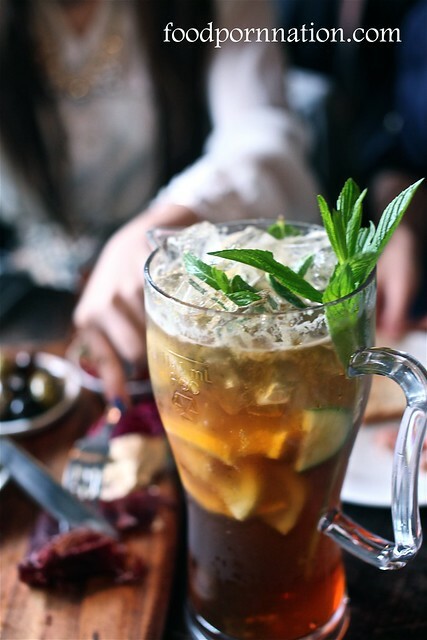 The ginormous jug of Pimm’s was definitely enough to corrupt my poor innocent soul and get the conversation a flow, to talk to whom ever and say what ever. Salt and pepper squid came out sweet, juicy and fresh. 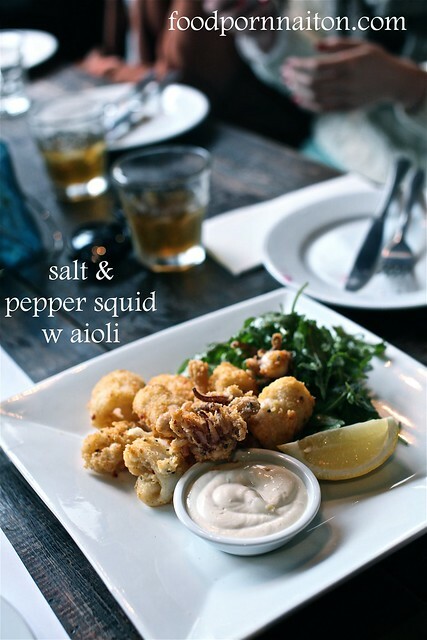 The aioli was so good you wanted to let the squid, sit, dip and rotate. And then sit some more in all its garlicky glory. 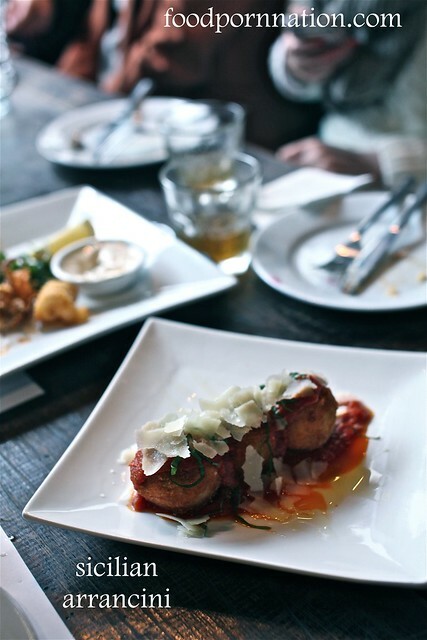 smoked mozzarella arrancini, drizzled with tomato puree and crumbled parmesan. While tasty, I thought this dish was missing the robust flavours in an arrancini that I am used to seeing. Still the arrancini was sizeable enough lavishly covered in tomato puree, parmesan shavings. 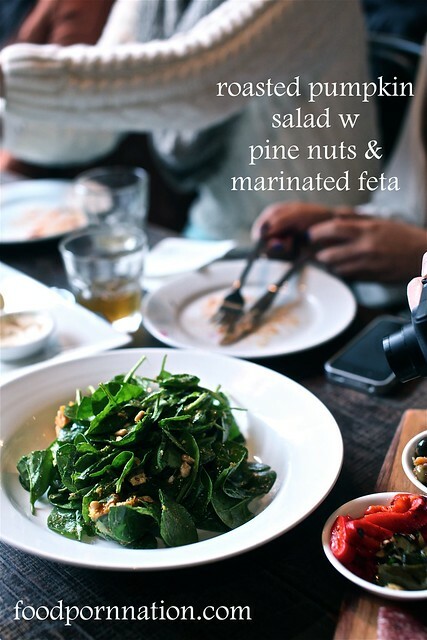 The addition of the simple yet a tasty salad of salty feta, toasty pine nuts and roasted fleshy pumpkin helped ease the damage I was doing to my poor arteries. 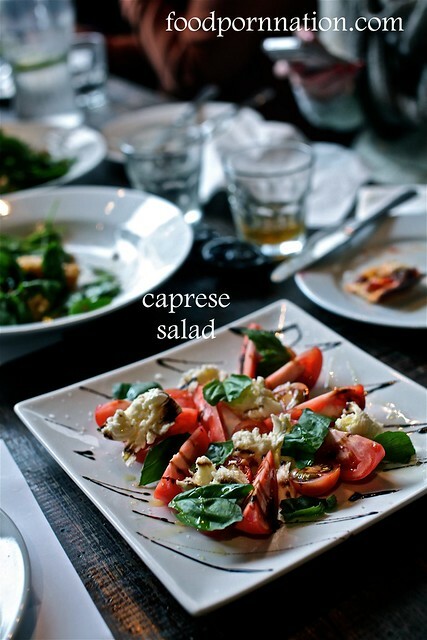 And let’s not forget the the tomato, basil and mozzarella salad too. Yep… anything to make me feel better. WOO! Kind of like the big mac meal with a diet coke combo. 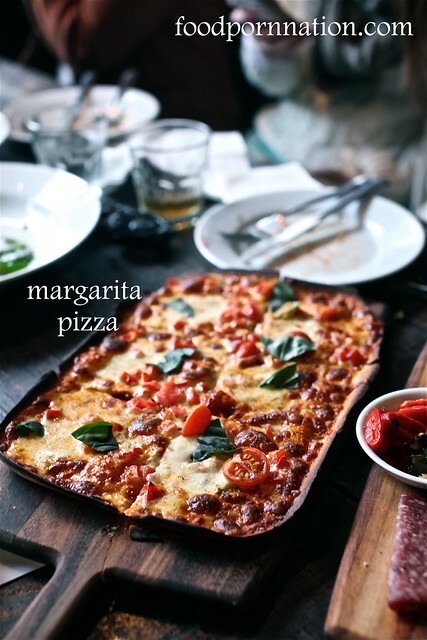 Quickly back on to carb mode, the margarita pizza was a simple and tasty number, served on a thin crust with a thin coating of tomato, cheese and basil. No muss, no fuss. I rarely ever “do” desserts. I’m more of a savoury over sweet kind-of-girl. 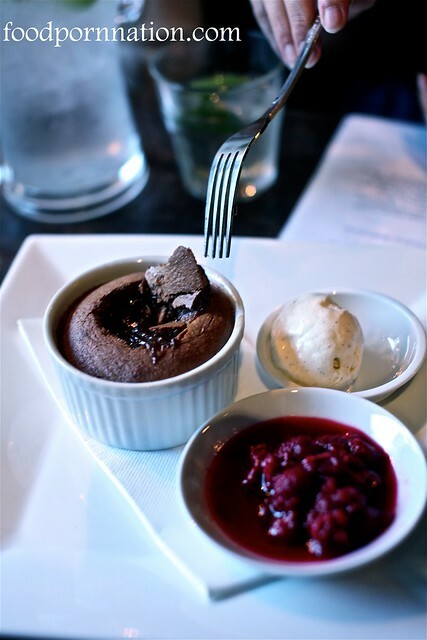 But this Chocolate Fondant made me food-o so hard at the table, it was unbelievable. I don’t think I have ever umm… done that over a dessert, let alone a chocolate one? It had that crumbly exterior, an interior of liquid chocolate silk and that vanilla bean ice cream was pretty bang on too. I just LOVE this shot of Yvn from Excuse Me Waiter poking in. She kept apologising (bless her) but really, I think it made for a great shot! I also think this shot accurately captures the scene and mood of the event, just times it by 30!! It’s quite funny seeing yourself being reflected back at you 30 times! 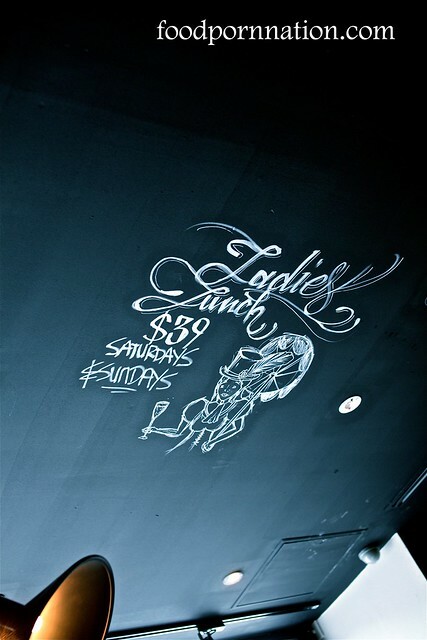 Welcome to the Ladies Lunch, for a perfect way to get the girls out, for a glass and half and a meal that’s a steal. If I have missed your post, please drop me a line and let me know! If you ever find yourself whisked away to the Blue Mountains area, there is one place you absolutely must try, Leura Garage. 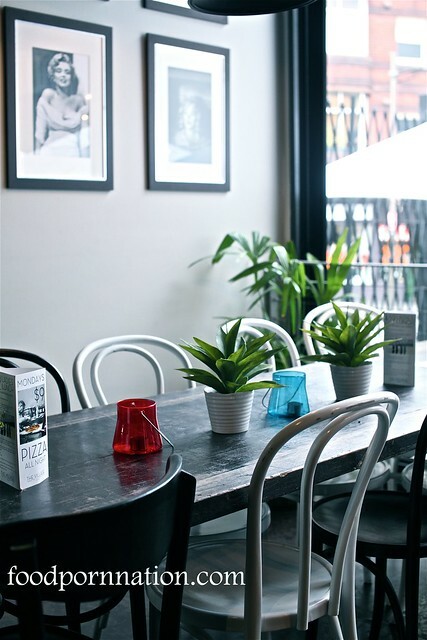 The used-to-be auto repair garage is a hidden gem serving up a varied menu across breakfast, lunch and dinner. 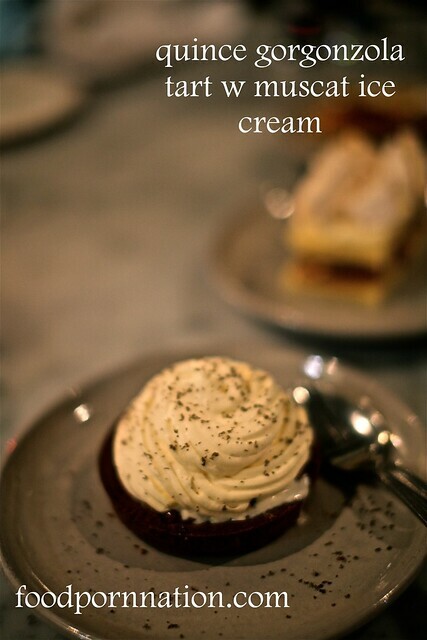 In the morning they offer muffins and pastries all the way up to your antipasto, pasta and tapas for dinner. Tonight we tried their tapas menu which seems to be a hot favourite here, to sample a few of the items they had on offer. 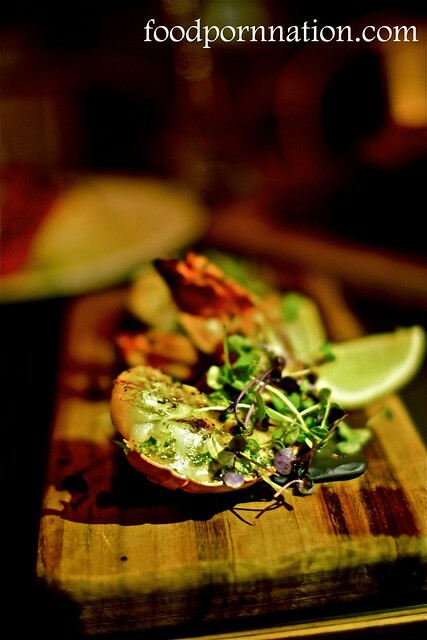 I was excited to be nibbling away at their lobster tail with lemon parsley butter but quickly we were off to a weak start. The lobster had too much fun in the sun. It was over cooked, disappointingly chewy and we could hardly tasty the lemon butter. It did have promise though. These baby pork ribs were tender, sticky and sweet. 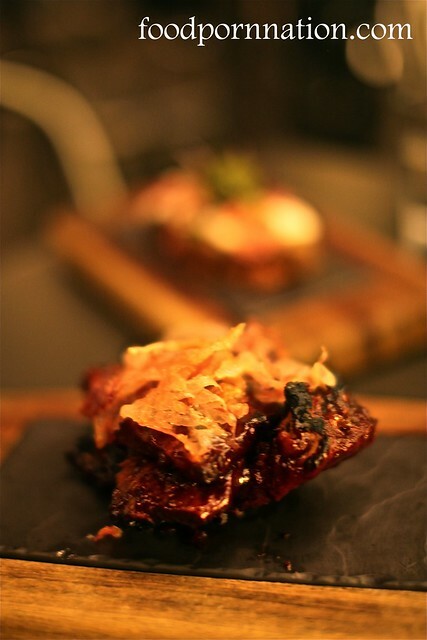 Meat chunks that easily ripped itself from the bone to reveal fibrous meat layers. They ribs were adorned with thin slivers of (never had that before) smokey pancetta that had been sliced paper thin (even thinner), baked then grilled to create whisper thin sheets of pancetta that had that flakey melt away in your mouth texture. They were definitely the highlight of the night. It’s a big call to make, but they were almost as good as the pork ribs at Hurricanes Grill! Or better. OH… hard to say. But good enough to commit to another hours drive to Leura. Oh I do love a good piece of swine!